Coming into this new season Dellin Betances was the biggest unknown on the Yankees’ roster. He struggled throwing strikes late last year and it rendered him unusable in anything other than an emergency in the postseason, and no one really knew what to expect in 2018. Would he fix himself like he did after late struggles in 2016 and 2017? Or continue to have problems? Through 21 team games the answer is … kind of both? Betances has had some good outings and bad outings, with the bad outings leaving a bigger dent in his season numbers. So far Dellin has a 6.23 ERA (5.26 FIP) with 15 strikeouts in 8.2 innings. To me, Betances does appear more comfortable and in control on the mound. There were times late last season he looked completely lost. I haven’t seen that yet this year. In those 8.2 innings there are good signs and bad signs. 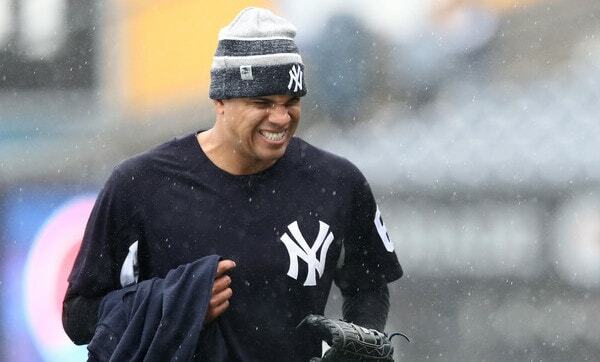 Reasons to believe Betances will be just fine — better than fine, really, since it’s not like he was a generic middle reliever from 2014-16 — and reasons to believe more trouble is on the way. Four things stand out to me so far. 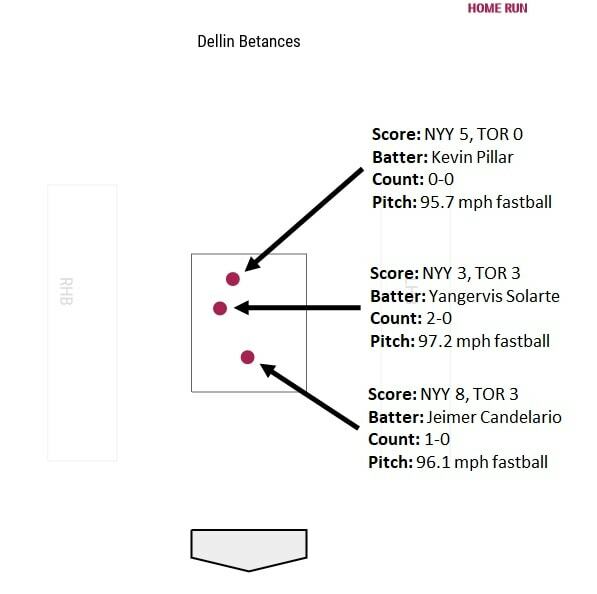 Betances has only walked three of the 38 batters he’s faced so far this season (7.9%) and he’s yet to hit a batter — Dellin hit eleven batters last season, seventh most in baseball behind six starters — so he’s been around the plate more often. It’s appeared that way to me watching the games and the numbers bear that out. It’s early. We’re only talking about 8.2 innings worth of pitches right now. So far though Betances has been more around the plate with both his fastball and breaking ball, and that was his big problem late last season. He didn’t have command problems last season. He had basic strike-throwing problems. Forget painting the corners. Dellin couldn’t throw the ball over the plate. He’s done a better job of it in the early going this year. Betances has allowed three home runs in his 8.2 innings this year. He allowed three home runs in 63.2 innings last year, including the postseason. Now he’s allowed three in 8.2 innings this year. Hmmm. Here’s the weird thing: Betances has allowed three fly balls all season. All three have gone over the fence. HMMM. Three fastballs out over the plate, two when the hitter was ahead in the count, and two that had no real impact on the outcome of the game. All three to the first batter of the inning too. After the Pillar homer Betances said he was “ambushed … just trying to groove one in there, and I didn’t think he would swing.” He retired the next three batters, so no harm no foul. The three homers — the only three fly balls Betances has allowed this season — had a combined exit velocity of 108.4 mph, which is a good little poke. Last year Dellin allowed an average 89.5 mph exit velocity on fly balls and only two individual fly balls with an exit velocity over 100 mph. This year he’s already allowed three. I’m not sure what to think about the home runs. We’re talking about three pitches here, and no, Betances won’t carry a 100.0% HR/FB rate all year. At the same time, is there something beyond general baseball randomness that explains the uptick in hard hit fly balls? Given that we’re talking about 8.2 innings here, I’m going to stamp this as “need to see more” before making any conclusions. The swing-and-miss ability is still there in the early going. That’s good. Even after only 8.2 innings, I’d be pretty worried if any pitcher suddenly lost his ability to get swings and misses when his entire game is built around getting swings and misses. Betances is still generating empty swings like few others. He’s throwing more pitches in the zone too, remember. Pitches in the zone are easier to hit, yet his swing-and-miss hasn’t suffered. Good news. For all the talk about Dellin’s velocity being down this year, his fastball is averaging 97.2 mph and it’s topped out at 99.7 mph. Last April he averaged 97.4 mph and topped out at 99.2 mph. The year before it was 97.2 mph and 100.0 mph, respectively. The velocity is right where it always is this time of year. Betances tends to reach his peak velocity in the summer months like most pitchers. We’ll see more 99s and 100s in a few weeks. The league average fastball spin rate has hovered right around 2,200 rpm since Statcast became a thing in 2015, and from 2015-17, Betances was well above that mark. So far this year his fastball has been essentially league average. Well that doesn’t look good. The spin rate on Betances’ fastball has declined every month since last April and the trend has continued this year. A low spin rate isn’t necessarily a bad thing. Low spin is conducive to ground balls. You don’t want to be league average though, where Dellin sits right now. You either want high spin (swings and misses) or low spin (grounders). Nothing in the middle. Betances is 30 years old now with over 1,000 innings on his arm, plus he had some arm problems earlier in his career, most notably Tommy John surgery in 2009. The drop in spin could simply be a wear-and-tear thing. Or it could be a mechanical issue. I’m not sure. The drop in spin could explain the homers — again, all three came on heaters — though it’s still so early. The spin rate issue is definitely a #thingtowatch going forward. Late last season Betances was untrustworthy because he couldn’t throw strikes. It wasn’t a command issue. It was a basic strike-throwing issue. He couldn’t get the ball over the plate all. This year Betances has been around the zone more often in the early going, and he’s still getting plenty of swings and misses. His spin rate is down though, and for whatever reason he’s been homer prone. Four weeks into the season, red flags still exist with Dellin, but there are some positives too.